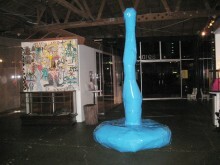 From the outside, Royal/T looks more like a Japanese art gallery than a restaurant. The inside isn’t much different until you realize the women in the anime-style outfits are actually waitresses and the tables set up aren’t simply for a small cafe attached to a gallery. Since I knew ahead of time that Royal/T was a restaurant, I was actually surprised to find how much of the space was dedicated to the art. It gave the restaurant quite a unique atmosphere, which is great, but I was there for the food. Since it’s restaurant week, I avoided the regular menu and only looked at their set menu. Check it out here. I started with the Crispy Spicy Tuna, got the Hanger Steak Frites for the main course and was planning to finish with the fresh fruits and vanilla custard. Unfortunately they were out of this dessert and I later learned that they ran out of the Kobe Beef sliders. To make up for the lack of dessert, though, they allowed us to order any dessert from their menu, so I chose the cheesecake. micro wasabi. None of these ingredients were veggie-like, so I was a bit surprised to find clovers on the tuna. Too hungry to pick off the clovers, I prayed that they weren’t covered in salmonella and took my first bite. Thankfully there was no clover taste or texture. 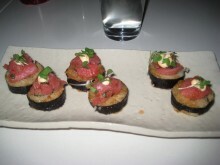 Although, I had expected the tuna itself to be crispy, I found it was more like tuna tartare and quite tasty. While many participants in restaurant week pulled a fast one in only offering salads as their first course, I was very happy that Royal/T chose not to skimp. Hanger steak with crazy sauce. 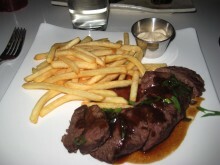 My steakish main course came with a “red wine eel sauce reduction,” fries and a wasabi aioli. Red wine eel sauce reduction was quitea wordy a description for the sauce that came with my steak, but it was pretty good. The steak came cooked medium-well, which was a bit too brown, and had a texture similar to brisket. The fries were a little too salty, but were great when dipped in the aioli. 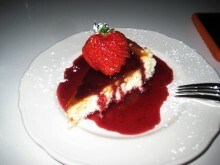 through my cheesecake, which had a tart berry sauce on it. It was a good way to finish a pretty good meal. In general, the food wasn’t spectacular for the price (except during restaurant week), but coupled with the art galleries and general unique ambiance, Royal/T is definitely a place worth visiting.